Know your opponent. Win against all odds. Kaiji: The Ultimate Gambler (2009) is a Japanese psychological thriller based on Noboyuki Fukumoto's manga series of the same name, "Kaiji". 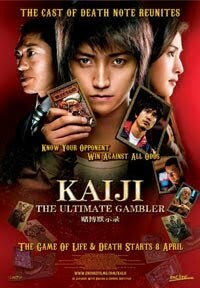 Kaiji (Tatsuya Fujiwara from "Death Note") is a young man who lives an aimless and mundane life. One day, he's invited to board a ship with hopes that by playing a game, he would be able to change his debt-ridden life. What Kaiji and other young men on board don't realize is that they have been conned into a deadly organized gambling competition by Teiai (Love Emperor), whereby winners will have their financial debt erased and losers will face a lifetime of hard-labor in an underground social system. Gambling in this movie doesn't refer to gambling or fighting in casinos like those in Hong Kong movies. Kaiji: The Ultimate Gambler adopts a different approach; it draws a strong picture of how people are forced to gamble their life because they are left with no choice. The strong portrayal of society's reality, i.e. clear segregation between the elites/rich and those who are perpetual losers/poor is very disturbing. Also, the death-defying situations that the gamblers need to go through are emotional and heart-gripping and in fact, the key entertaining element in this movie.